The British sportscar maker has enjoyed a landmark year and will display a whole host of products from across the entire Caterham Group; headlined by the AeroSeven concept car which was revealed at the Singapore Grand Prix earlier this year. In addition to the concept, the 2013 CT03 Caterham F1 car will be on the stand, alongside the SP/300.R racing and trackday car, the new Superlight R300 championship race car, the Seven 485 SV and the Caterham Kart. 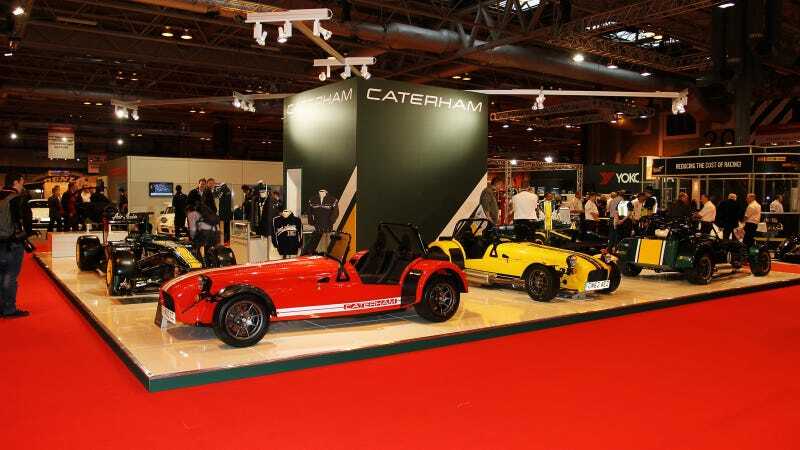 In Hall 4, the ever-popular Caterham Experience will be running for the duration of the 4-day-long show. Visitors can experience a thrilling passenger ride in a Seven alongside Caterham's team of professional drivers on a bespoke indoor drift course. In addition, a limited number of lucky visitors will also have the chance to get behind the wheel and master the art of donutting for themselves with Caterham's team of expert tyre screechers. Spaces on the Caterham Donut School are limited and are a firm favourite with show goers; book early to avoid disappointment. The AeroSeven concept, which will go on sale next year, was designed with significant input from all of the Caterham Group divisions and draws heavily on methods and technologies used by the F1 team. The AeroSeven will be the very first Caterham to be fitted with traction control, thanks to a newly-developed Caterham Engine Management System. The concept features styling that hints strongly towards the future of Caterham design. In October, Caterham launched its most accessible model to date – the Caterham Seven 160 – which is powered by a three-cylinder 80hp Suzuki engine and is priced from just £14,995 in component form. A special, handmade cut-away model of the entry-level car will be on show alongside Caterham's most powerful Seven ever, the 620R. At the opposite end of the performance spectrum to the 160, the 620R boasts 310bhp and achieves 0-60 mph in just 2.79 seconds. At last year's Autosport International Show, the firm revealed the brand new Caterham Kart - which will form the basis of a new, accessible karting championship in the UK. The new championship is open to 13 – 16 year olds and entry into the series is priced at just £5,994. True to Caterham's ethos of making performance accessible, the championship intends to revive karting as a sport in its own right and will commence in 2015. Visitors to the show will find Caterham on stand 2540 in Hall 20 and the Caterham Drive Experience can be found in hall 4. Any Caterham driver who brings their Seven key to the stand will also be entitled to a complimentary beverage in the exclusive customer area.